Astounding beauty is abundant below the Mason-Dixon Line. The Blue Ridge Parkway immediately comes to mind, as does Stone Mountain, Ga. and the Carolina coasts. But the epitome of Southern beauty lies in its universities. I see it every day at Virginia Tech, and at other Southern colleges I have had the pleasure of visiting. Every campus displays scenery and landmarks that set it apart from the rest. With VT nestled between the Blue Ridge and Allegheny Mountains, I am blessed with a mountain view from any point on campus. One of my favorite campus icons is the VPI Memorial. Anyone can enjoy a moment (or an hour) sitting atop War Memorial Chapel gazing across the lush green drill field. The memorial’s eight pylons represent Brotherhood, Honor, Leadership, Service, Loyalty, Sacrifice, Duty, and Ut Prosim, “that I may serve,” which is the university’s motto. 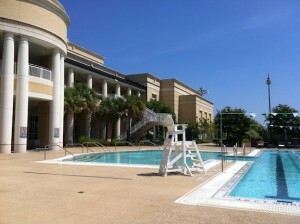 The Strom Thurmond Fitness & Wellness Center. On the opposite end of the spectrum, the University of South Carolina has a more tropical flair to its campus. Palm trees dot every corner and line every street. Campus feels like a beach resort, even during the winter months. The pool is a perfect spot for some post-class relaxation. From mountains to the tropics, Southern universities offer it all. But Southern beauty extends much deeper than physical charm. Traditions are huge in the South, and they are deeply honored at college. At my parents’ alma mater UNC-Chapel Hill, students take a sip of good luck from the Old Well on the first day of classes. Students at the University of Georgia in Athens admire the iconic Arch. Legend has it that if you walk beneath it before graduation, you won’t graduate. A little farther south at Auburn University in Auburn, Ala., students enjoy the beauty of Samford and Cater Lawns, especially when it’s time for Call-Outs. These traditions and more make Southern college life fun and special for all involved. There is also a familial atmosphere to Southern colleges. Auburn is full of southern charm, sophistication and overall hospitality. 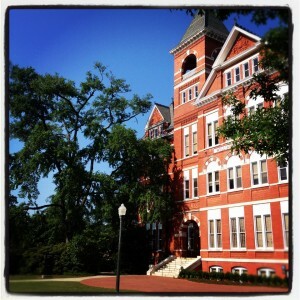 No one hesitates to call out “War Eagle!” to anyone, no matter if they’re a student, alum, or first-time visitor. Hokie Nation is no different. During my first visit, students and families were happy to give directions or recommend the best spot for dinner. Now that I’m a student, I always return the favor, because I know how helpful it is to have that word of advice. Downtown Athens offers an eclectic mix of cuisines, from Mexican to Italian and everything in between. The friendly owners often draw back repeat customers. The South is known for its hospitality, after all. But what is most astounding about Southern schools is the spirit. VT’s Lane Stadium is electric with the sounds of Metallica’s “Enter, Sandman” as 66,233 fans welcome the Hokies to Worsham Field. At UNC, Tar Heels take pride in rushing Franklin Street and painting campus Carolina Blue, especially after big victories over archrival Duke. And of course, SEC football delivers breathtaking performances, week in and week out, every season. There is nothing like partying with 66,000, or 90,000 if you’re at UGA’s Sanford Stadium, of your closest friends every Saturday. From the landscapes to the landmarks, to the atmospheres and spirit, there is nothing quite like the Southern college experience. There is a fit for everyone no matter where you travel across the South. I found mine in Blacksburg, Va. Where will you find yours? 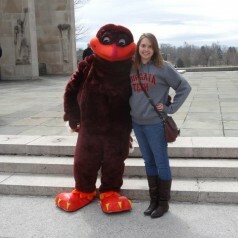 Kate Robertson is a features writer for Pretty Southern, and a rising senior at Virginia Tech, studying communication and English. 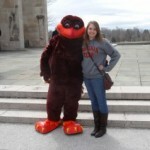 Originally form Atlanta, Kate plans to graduate in 2014 to launch a professional career in writing and public relations. Follow her on Twitter @kate3robertson. Editor’s note, thanks to Caroline Harrell (a junior at Auburn) and Meghan McCloskey (a sophomore at South Carolina) for the great photos.